Since word emerged on Sunday that Jeish Al-Adl executed one of the five Iranian border guards that had been abducted last month, there has been a very interesting series of developments between Iran and Pakistan. Iran has summoned Pakistan’s ambassador to lodge a formal complaint about the death and Pakistan’s apparent inability to find the terrorist group and release the hostages. Iran’s Foreign Minister also sent an open letter to the UN, appealing for help in controlling “state sponsored” groups that are responsible for this and other attacks on Iran. Pakistan, meanwhile, has announced today that they don’t believe the border guards are being held in Pakistan. Complicating matters even further, Iran now is claiming that it would be within their right to employ special forces in a raid on Pakistani territory to release the hostages and kill those responsible for the kidnapping. Iran’s Foreign Ministry has summoned Pakistan’s ambassador to Tehran over Iranian kidnapped guard’s death and expressed strong objections to Pakistan for lack of control of its borders. Deputy Director General of the department of West Asian countries of Iran’s Foreign Ministry expressed Islamic Republic of Iran’s objection on Iranian border guards’ abduction and their transfer to Pakistan emphasizing on Iran’s demand for their release, health and also delivering the terrorists to Iran. Pakistan’s ambassador to Iran, Noor Mohammad Jadmani, offered condolences for one of the Iranian abducted guard’s death in Pakistan and expressed regret for the terrorist incident. It is extremely regrettable that all available evidence indicate that these cowardly acts of terror targeting the Islamic Republic of Iran and its citizens have been perpetrated by State-sponsored extremist groups, with similar patterns of funding, coordination, support and direction. The entire international community should be alarmed by the regional and extra-regional ramifications of sectarian tension and extremist violence, which are being systematically organized, sponsored and orchestrated in various parts of our region. In fact, learning from recent history, a sober assessment of the medium and long-term implications of this dangerous trend will show that the very sponsors of such hatred, who for ill-conceived interests have hastily resorted to such short-sighted tactics to remedy their strategic miscalculations and failures, stand to lose the most from the sectarian and extremist violence that they are spreading. What a strange passage. In protesting attacks against themselves, it appears that the Iranians are making a not very veiled threat to carry out their own “sectarian and extremist violence” against those they perceive to be behind the attacks. The United Nations is the best source of information on the impact of the war in Afghanistan on civilians. 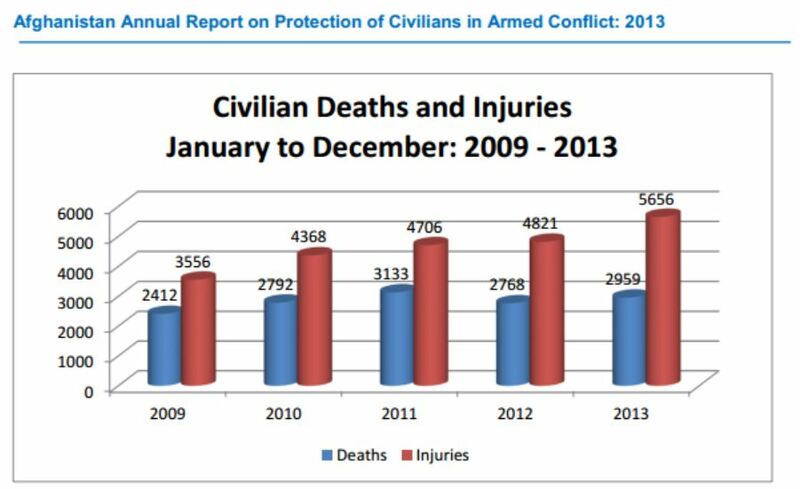 They released their latest data this weekend (pdf), and their results show that the vaunted “surge” of US troops into the country in early 2010 through late 2012 failed to protect civilians. In fact, the data show that civilian injuries have shown a steady rise from 2009 pre-surge levels through 2013’s post-surge period. 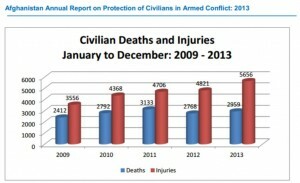 Civilian deaths rose in 2010 and 2011. They went down slightly in 2012 before rising again in 2013. Very quietly, the surge of troops into Afghanistan that President Obama announced to such fanfare in late 2009 is now over. Defense Secretary Leon Panetta said today that 33,000 troops have been withdrawn, calling the Afghan surge “a very important milestone” in a war the Obama administration is winding down; there are sill 68,000 U.S. troops in Afghanistan. The “surge did accomplish its objectives of reversing the Taliban momentum on the battlefield and dramatically increase the size and capability of the Afghan national security forces,” Panetta said. This quarter, ANSF’s assigned force strength was 334,852, according to data provided by CSTC-A. This is short of the goal to have an end strength of 352,000 ANSF personnel by October 2012. 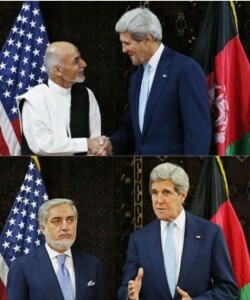 That goal had been in the Department of Defense’s (DOD) April 2012 Report on Progress Toward Security and Stability in Afghanistan. When that end strength was not met, DOD revised the goal to 352,000 ANSF by 2014 (187,000 ANA by December 2012, 157,000 ANP by February 2013, and 8,000 Air Force by December 2014). Neither the ANA nor the ANP met their end-strength goal by the revised deadline, as shown in Table 3.6. Syrian Moderate Coalition Fractures — Is al Nusra the Next MEK? The US grand strategy of arming moderate groups within Syria’s opposition in the ongoing civil war (remember, we only arm folks so moderate that they eat enemies’ hearts) took a huge blow yesterday, as several groups previously aligned with the moderates threw their support into a group including the Islamist group Jabhat al Nusra, which has affiliations with al Qaeda. With the moderate coalition in disarray, it occurred to me to wonder whether al Nusra will now undergo a reputation-scrubbing and a lobbying campaign similar to that applied to MEK, which has been removed from the official list of terrorist organizations and continues to support US politicians who are willing to sell their services to any group with enough funding. There is hope for the future, though, as a UN treaty that would take significant steps toward stemming the flow of conventional weapons is gathering steam and has now been signed by more than half of the members of the UN. Abu Hassan, a spokesman for the Tawheed Brigade in Aleppo, echoed those sentiments, citing rebel disappointment with the Obama administration’s failure to go ahead with threatened airstrikes to punish Assad for using chemical weapons in the suburbs of Damascus last month, as well as its decision to strike a deal with Russia over ways to negotiate a solution. https://www.emptywheel.net/wp-content/uploads/2016/07/Logo-Web.png 0 0 Jim White https://www.emptywheel.net/wp-content/uploads/2016/07/Logo-Web.png Jim White2013-09-26 09:06:162013-09-26 09:06:16Syrian Moderate Coalition Fractures -- Is al Nusra the Next MEK?